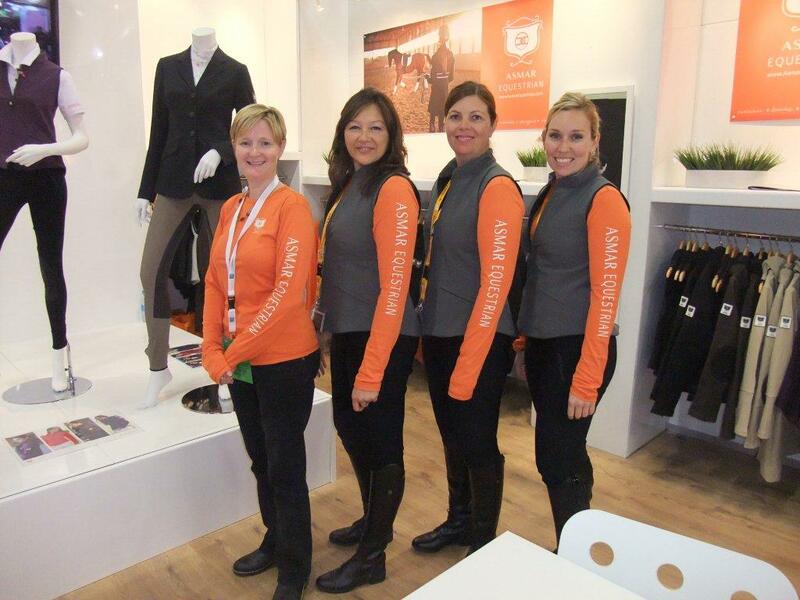 The Asmar Equestrian team has just returned from the Spoga Horse Autumn International Trade Fair in Cologne, Germany; our first time at the Autumn event. We had a wonderful time talking to people involved in equestrian trade from all over the world, and were excited to see some British visitors too. Our UK representative Kathy Carter, pictured bottom left, joined the Canadian team to help spread the word about this exciting, aspirational clothing brand. The event is a great chance to show off our products, and we were thrilled that our All Weather Jacket was shortlisted in the innovation award category – that means the judges thought our jacket was one of the top five items for riders at the show, out of the many thousands of products exhibited! We have some really exciting products launching soon, and they were available for retailers and fashion buyers to ‘play with’ and try on at Spoga. With fabrics as technical and tailored as ours, people do need to see the products first hand to really get a feel for them!